The Gansu Wind Farm in China is the largest wind farm in the world, with a target capacity of 20,000 MW by 2020. The Shepherds Flat Wind Farm is an 845 MW wind farm in the U.S. state of Oregon. A wind farm or wind park is a group of wind turbines in the same location used to produce electricity. A large wind farm may consist of several hundred individual wind turbines and cover an extended area of hundreds of square miles, but the land between the turbines may be used for agricultural or other purposes. A wind farm can also be located offshore. Many of the largest operational onshore wind farms are located in China, India, and the United States. For example, the largest wind farm in the world, Gansu Wind Farm in China had a capacity of over 6,000 MW by 2012, with a goal of 20,000 MW by 2020. As of September 2018, the 659 MW Walney Wind Farm in the UK is the largest offshore wind farm in the world. Individual wind turbine designs continue to increase in power, resulting in fewer turbines being needed for the same total output. See list of most powerful wind turbines. The location is critical to the success of a wind farm. Conditions contributing to a successful wind farm location include: wind conditions, access to electric transmission, physical access, and local electric prices. The faster the average windspeed, the more electricity the wind turbine will generate, so faster winds are economically better for wind farm developers. The balancing factor is that strong gusts and high turbulence require stronger more expensive turbines, otherwise they risk damage. The ideal wind conditions would be strong steady winds with low turbulence coming from a single direction. Usually sites are screened on the basis of a wind atlas, and validated with wind measurements. Meteorological wind data alone is usually not sufficient for accurate siting of a large wind power project. Collection of site specific data for wind speed and direction is crucial to determining site potential in order to finance the project. Local winds are often monitored for a year or more, and detailed wind maps are constructed before wind generators are installed. The wind blows faster at higher altitudes because of the reduced influence of drag. The increase in velocity with altitude is most dramatic near the surface and is affected by topography, surface roughness, and upwind obstacles such as trees or buildings. How closely to space the turbines together is a major factor in wind farm design. The closer the turbines are together the more the upwind turbines block wind from their neighbors. However spacing turbines far apart increases the costs of roads and cables, and raises the amount of land needed to install a specific capacity of turbines. As a result of these factors, turbine spacing varies by site. Generally speaking manufacturers require 3.5 times the rotor diameter of the turbine between turbines as a minimum. Closer spacing is possible depending on the turbine model, the conditions at the site, and how the site will be operated. The world's first wind farm was 0.6 MW, consisting of 20 wind turbines rated at 30 kilowatts each, installed on the shoulder of Crotched Mountain in southern New Hampshire in December 1980. Onshore turbine installations in hilly or mountainous regions tend to be on ridges generally three kilometres or more inland from the nearest shoreline. This is done to exploit the topographic acceleration as the wind accelerates over a ridge. The additional wind speeds gained in this way can increase energy produced because more wind goes through the turbines. The exact position of each turbine matters, because a difference of 30m could potentially double output. This careful placement is referred to as 'micro-siting'. Offshore wind turbines near Copenhagen, Denmark. Europe is the leader in offshore wind energy, with the first offshore wind farm (Vindeby) being installed in Denmark in 1991. As of 2010, there are 39 offshore wind farms in waters off Belgium, Denmark, Finland, Germany, Ireland, the Netherlands, Norway, Sweden and the United Kingdom, with a combined operating capacity of 2,396 MW. More than 100 GW (or 100,000 MW) of offshore projects are proposed or under development in Europe. The European Wind Energy Association has set a target of 40 GW installed by 2020 and 150 GW by 2030. As of 2017[update], The Walney Wind Farm in the United Kingdom is the largest offshore wind farm in the world at 659 MW, followed by the London Array (630 MW) also in the UK. Offshore wind turbines are less obtrusive than turbines on land, as their apparent size and noise is mitigated by distance. Because water has less surface roughness than land (especially deeper water), the average wind speed is usually considerably higher over open water. Capacity factors (utilisation rates) are considerably higher than for onshore locations. The province of Ontario in Canada is pursuing several proposed locations in the Great Lakes, including the suspended Trillium Power Wind 1 approximately 20 km from shore and over 400 MW in size. Other Canadian projects include one on the Pacific west coast. In 2010, there were no offshore wind farms in the United States, but projects were under development in wind-rich areas of the East Coast, Great Lakes, and Pacific coast; and in late 2016 the Block Island Wind Farm was commissioned. Installation and service / maintenance of off-shore wind farms are a specific challenge for technology and economic operation of a wind farm. As of 2015[update], there are 20 jackup vessels for lifting components, but few can lift sizes above 5MW. Service vessels have to be operated nearly 24/7 (availability higher than 80% of time) to get sufficient amortisation from the wind turbines. Therefore, special fast service vehicles for installation (like Wind Turbine Shuttle) as well as for maintenance (including heave compensation and heave compensated working platforms to allow the service staff to enter the wind turbine also at difficult weather conditions) are required. So-called inertial and optical based Ship Stabilization and Motion Control systems (iSSMC) are used for that. Experimental wind farms consisting of a single wind turbine for testing purposes have been built. One such installation is Østerild Wind Turbine Test Field. Airborne wind farms have been envisaged. Such wind farms are a group of airborne wind energy systems located close to each other connected to the grid at the same point. Wind farms consisting of diverse wind turbines have been proposed in order to efficiently use wider ranges of wind speeds. Such wind farms are proposed to be projected under two criteria: maximization of the energy produced by the farm and minimization of its costs. In just five years, China leapfrogged the rest of the world in wind energy production, going from 2,599 MW of capacity in 2006 to 62,733 MW at the end of 2011. However, the rapid growth outpaced China's infrastructure and new construction slowed significantly in 2012. At the end of 2009, wind power in China accounted for 25.1 gigawatts (GW) of electricity generating capacity, and China has identified wind power as a key growth component of the country's economy. With its large land mass and long coastline, China has exceptional wind resources. Researchers from Harvard and Tsinghua University have found that China could meet all of their electricity demands from wind power by 2030. By the end of 2008, at least 15 Chinese companies were commercially producing wind turbines and several dozen more were producing components. Turbine sizes of 1.5 MW to 3 MW became common. Leading wind power companies in China were Goldwind, Dongfang Electric, and Sinovel along with most major foreign wind turbine manufacturers. China also increased production of small-scale wind turbines to about 80,000 turbines (80 MW) in 2008. Through all these developments, the Chinese wind industry appeared unaffected by the global financial crisis, according to industry observers. According to the Global Wind Energy Council, the development of wind energy in China, in terms of scale and rhythm, is absolutely unparalleled in the world. The National People's Congress permanent committee passed a law that requires the Chinese energy companies to purchase all the electricity produced by the renewable energy sector. First wind farm consisting of 7.5 megawatt (MW) Enercon E-126 turbines (Estinnes, Belgium, 20 July 2010), two months before completion; note the 2-part blades. The European Union has a total installed wind capacity of 93,957 MW. Germany has the third-largest capacity in the world (after China and the United States) with an installed capacity was 29,060 MW at the end of 2011, and Spain has 21,674 MW. Italy and France each had between 6,000 and 7,000 MW. By January 2014, the UK installed capacity was 10,495 MW. But energy production can be different from capacity – in 2010, Spain had the highest European wind power production with 43 TWh compared to Germany's 35 TWh. Europe's largest windfarm is the 'London Array', an off-shore wind farm in the Thames Estuary in the United Kingdom, with a current capacity of 630 MW (the world's largest off-shore wind farm). Other large wind farms in Europe include Fântânele-Cogealac Wind Farm near Constanța, Romania with 600 MW capacity, and Whitelee Wind Farm near Glasgow, Scotland which has a total capacity of 539 MW. An important limiting factor of wind power is variable power generated by wind farms. In most locations the wind blows only part of the time, which means that there has to be back-up capacity of conventional generating capacity to cover periods that the wind is not blowing. To address this issue it has been proposed to create a "supergrid" to connect national grids together across western Europe, ranging from Denmark across the southern North Sea to England and the Celtic Sea to Ireland, and further south to France and Spain especially in Higueruela which was for some time the biggest wind farm in the world. The idea is that by the time a low pressure area has moved away from Denmark to the Baltic Sea the next low appears off the coast of Ireland. Therefore, while it is true that the wind is not blowing everywhere all of the time, it will always be blowing somewhere. India has the fifth largest installed wind power capacity in the world. As of 31 March 2014, the installed capacity of wind power was 21136.3 MW mainly spread across Tamil Nadu state (7253 MW). Wind power accounts nearly 8.5% of India's total installed power generation capacity, and it generates 1.6% of the country's power. 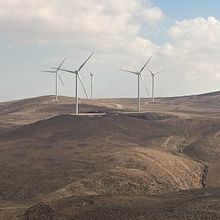 The Tafila Wind Farm in Jordan, is the first large scale wind farm in the region. The 117 MW Tafila Wind Farm in Jordan was inaugurated in December 2015, and is the first large scale wind farm project in the region. Morocco has undertaken a vast wind energy program, to support the development of renewable energy and energy efficiency in the country. The Moroccan Integrated Wind Energy Project, spanning over a period of 10 years with a total investment estimated at $3.25 billion, will enable the country to bring the installed capacity, from wind energy, from 280 MW in 2010 to 2000 MW in 2020. Pakistan has wind corridors in Jhimpir, Gharo and Keti Bundar in Sindh province and is currently developing wind power plants in Jhimpir and Mirpur Sakro (District Thatta). The government of Pakistan decided to develop wind power energy sources due to problems supplying energy to the southern coastal regions of Sindh and Balochistan. The Zorlu Energy Putin Power Plant is the first wind power plant in Pakistan. The wind farm is being developed in Jhimpir, by Zorlu Energy Pakistan the local subsidiary of a Turkish company. The total cost of project is $136 million. Completed in 2012, it has a total capacity of around 56MW. Fauji Fertilizer Company Energy Limited, has build a 49.5 MW wind Energy Farm at Jhimpir. Contract of supply of mechanical design was awarded to Nordex and Descon Engineering Limited. Nordex a German wind turbine manufacturer. In the end of 2011 49.6 MW will be completed.Pakistani Govt. also has issued LOI of 100 MW Wind power plant to FFCEL. Pakistani Govt. has plans to achieve electric power up to 2500 MW by the end of 2015 from wind energy to bring down energy shortage. Currently four wind farms are operational (Fauji Fertilizer 49.5 MW (subsidiary of Fauji Foundation), Three Gorges 49.5 MW, Zorlu Energy Pakistan 56 MW, Sapphire Wind Power Co Ltd 52.6 MW) and six are under construction phase ( Master Wind Energy Ltd 52.6 MW, Sachal Energy Development Ltd 49.5 MW, Yunus Energy Ltd 49.5 MW, Gul Energy 49.5 MW, Metro Energy 49.5 MW, Tapal Energy ) and expected to achieve COD in 2017. In Gharo wind corridor, two wind farms (Foundation Energy 1 & II each 49.5 MW) are operational while two wind farms Tenaga Generasi Ltd 49.5 MW and HydroChina Dawood Power Pvt Ltd 49.5 are under construction and expected to achieve COD in 2017. According to a USAID report, Pakistan has the potential of producing 150,000 megawatts of wind energy, of which only the Sindh corridor can produce 40,000 megawatts. The Philippines has the first windfarm in Southeast Asia. Located Northern part of the countries' biggest island Luzon, alongside the seashore of Bangui, Ilocos Norte. The wind farm uses 20 units of 70-metre (230 ft) high Vestas V82 1.65 MW wind turbines, arranged on a single row stretching along a nine-kilometer shoreline off Bangui Bay, facing the West Philippine Sea. Phase I of the NorthWind power project in Bangui Bay consists of 15 wind turbines, each capable of producing electricity up to a maximum capacity of 1.65 MW, for a total of 24.75 MW. The 15 on-shore turbines are spaced 326 metres (1,070 ft) apart, each 70 metres (230 ft) high, with 41 metres (135 ft) long blades, with a rotor diameter of 82 metres (269 ft) and a wind swept area of 5,281 square metres (56,840 sq ft). Phase II, was completed on August 2008, and added 5 more wind turbines with the same capacity, and brought the total capacity to 33 MW. All 20 turbines describes a graceful arc reflecting the shoreline of Bangui Bay, facing the West Philippine Sea. Adjacent municipalities of Burgos and Pagudpud followed with 50 and 27 wind turbines with a capacity of 3 MW each for a Total of 150 MW and 81 MW respectively. Two other wind farms were built outside of Ilocos Norte, the Pililla Wind Farm in Rizal and the Mindoro Wind Farm near Puerto Galera in Oriental Mindoro. Sri Lanka has received funding from the Asian Development Bank amounting to $300 million to invest in renewable energies. From this funding as well as $80 million from the Sri Lankan Government and $60 million from France’s Agence Française de Développement, Sri Lanka is building two 100MW wind farms from 2017 due to be completed by late 2020 in Northern Sri Lanka. Turbines at the Gouda Wind Facility just outside the town of Gouda, South Africa. As of September 2015 a number of sizable wind farms have been constructed in South Africa mostly in the Western Cape region. These include the 100 MW Sere Wind Farm and the 138 MW Gouda Wind Facility. Most future wind farms in South Africa are earmarked for locations along the Eastern Cape coastline. Eskom has constructed one small scale prototype windfarm at Klipheuwel in the Western Cape and another demonstrator site is near Darling with phase 1 completed. The first commercial wind farm, Coega Wind Farm in Port Elisabeth, was developed by the Belgian company Electrawinds. U.S. wind power installed capacity in 2012 exceeded 51,630 MW and supplies 3% of the nation's electricity. New installations place the U.S. on a trajectory to generate 20% of the nation’s electricity by 2030 from wind energy. Growth in 2008 channeled some $17 billion into the economy, positioning wind power as one of the leading sources of new power generation in the country, along with natural gas. Wind projects completed in 2008 accounted for about 42% of the entire new power-producing capacity added in the U.S. during the year. At the end of 2008, about 85,000 people were employed in the U.S. wind industry, and GE Energy was the largest domestic wind turbine manufacturer. Wind projects boosted local tax bases and revitalized the economy of rural communities by providing a steady income stream to farmers with wind turbines on their land. Wind power in the U.S. provides enough electricity to power the equivalent of nearly 9 million homes, avoiding the emissions of 57 million tons of carbon each year and reducing expected carbon emissions from the electricity sector by 2.5%. Texas, with 10,929 MW of capacity, has the most installed wind power capacity of any U.S. state, followed by California with 4,570 MW and Iowa with 4,536 MW. The Alta Wind Energy Center (1,020 MW) in California is the nation's largest wind farm in terms of capacity. Altamont Pass Wind Farm is the largest wind farm in the U.S. in terms of the number of individual turbines. One of the biggest factors inhibiting wind farm construction is human opposition. A study has shown "turbine placement close to residents may heighten their uncertainty and concern of the wind turbines and overshadow any positive inclinations towards the development." Wind farm development is affected by the emphasis being primarily placed on the domain of landscape assessment and environmental impact when seeking farm sites. The viability and efficiency of the wind farm are barely touched upon, instead falling to the developer. One report in 2013 suggested that perhaps in some places where wind energy was becoming politically popular, engineering aspects, specifically energy yield are not being taken into consideration, either by the public or in the process of planning consent for wind farm development. As energy is the main purpose of wind farms, a lack of attention given to the subject could be detrimental to the general acceptance of wind farms. Livestock ignore wind turbines, and continue to graze as they did before wind turbines were installed. Compared to the environmental impact of traditional energy sources, the environmental impact of wind power is relatively minor. Wind power consumes no fuel, and emits no air pollution, unlike fossil fuel power sources. The energy consumed to manufacture and transport the materials used to build a wind power plant is equal to the new energy produced by the plant within a few months. While a wind farm may cover a large area of land, many land uses such as agriculture are compatible, with only small areas of turbine foundations and infrastructure made unavailable for use. There are reports of bird and bat mortality at wind turbines as there are around other artificial structures. The scale of the ecological impact may or may not be significant, depending on specific circumstances. The estimated number of bird deaths caused by wind turbines in the United States is between 140,000 and 328,000, whereas deaths caused by domestic cats in the United States are estimated to be between 1.3 and 4.0 billion birds each year and over 100 million birds are killed in the United States each year by impact with windows. Prevention and mitigation of wildlife fatalities, and protection of peat bogs, affect the siting and operation of wind turbines. A 2007 report by the U.S. National Research Council noted that noise produced by wind turbines is generally not a major concern for humans beyond a half-mile or so. Low-frequency vibration and its effects on humans are not well understood and sensitivity to such vibration resulting from wind-turbine noise is highly variable among humans. There are opposing views on this subject, and more research needs to be done on the effects of low-frequency noise on humans. In a 2009 report about "Rural Wind Farms", a Standing Committee of the Parliament of New South Wales, Australia, recommended a minimum setback of two kilometres between wind turbines and neighbouring houses (which can be waived by the affected neighbour) as a precautionary approach. A 2014 paper suggests that the 'Wind Turbine Syndrome' is mainly caused by the nocebo effect and other psychological mechanisms. Australian science magazine Cosmos states that although the symptoms are real for those who suffer from the condition, doctors need to first eliminate known causes (such as pre-existing cancers or thyroid disease) before reaching definitive conclusions with the caveat that new technologies often bring new, previously unknown health risks. Utility-scale wind farms must have access to transmission lines to transport energy. The wind farm developer may be obliged to install extra equipment or control systems in the wind farm to meet the technical standards set by the operator of a transmission line. The company or person that develops the wind farm can then sell the power on the grid through the transmission lines and ultimately chooses whether to hold on to the rights or sell the farm or parts of it to big business like GE, for example. Wind farms can interfere with ground radar systems used for military, weather and air traffic control. The large, rapidly moving blades of the turbines can return signals to the radar that can be mistaken as an aircraft or weather pattern. Actual aircraft and weather patterns around wind farms can be accurately detected, as there is no fundamental physical constraint preventing that. But aging radar infrastructure is significantly challenged with the task. The US military is using wind turbines on some bases, including Barstow near the radar test facility. The level of interference is a function of the signal processors used within the radar, the speed of the aircraft and the relative orientation of wind turbines/aircraft with respect to the radar. An aircraft flying above the wind farm's turning blades could become impossible to detect because the blade tips can be moving at nearly aircraft velocity. Studies are currently being performed to determine the level of this interference and will be used in future site planning. Issues include masking (shadowing), clutter (noise), and signal alteration. Radar issues have stalled as much as 10,000 MW of projects in USA. Some very long range radars are not affected by wind farms. Permanent problem solving include a non-initiation window to hide the turbines while still tracking aircraft over the wind farm, and a similar method mitigates the false returns. England's Newcastle Airport is using a short-term mitigation; to "blank" the turbines on the radar map with a software patch. Wind turbine blades using stealth technology are being developed to mitigate radar reflection problems for aviation. As well as stealth windfarms, the future development of infill radar systems could filter out the turbine interference. There are also reports of negative effects on radio and television reception in wind farm communities. Potential solutions include predictive interference modelling as a component of site selection. Wind turbines can often cause terrestrial television interference when the direct path between television transmitter and receiver is blocked by terrain. Interference effects become significant when the reflected signal from the turbine blades approaches the strength of the direct unreflected signal. Reflected signals from the turbine blades can cause loss of picture, pixellation and disrupted sound. There is a common misunderstanding that digital TV signals will not be affected by turbines — in practice they are. A 2010 study found that in the immediate vicinity of wind farms, the climate is cooler during the day and slightly warmer during the night than the surrounding areas due to the turbulence generated by the blades. In another study an analysis carried out on corn and soybean crops in the central areas of the United States noted that the microclimate generated by wind turbines improves crops as it prevents the late spring and early autumn frosts, and also reduces the action of pathogenic fungi that grow on the leaves. Even at the height of summer heat, the lowering of 2.5–3 degrees above the crops due to turbulence caused by the blades, can make a difference for the cultivation of corn. ^ a b Watts, Jonathan & Huang, Cecily. Winds Of Change Blow Through China As Spending On Renewable Energy Soars, The Guardian, 19 March 2012, revised on 20 March 2012. Retrieved 4 January 2012. ^ a b "World's largest offshore wind farm opens off Cumbrian coast". The Guardian. Retrieved 6 September 2018. ^ Wind energy-- the facts: a guide to the technology, economics and future of wind power page 32 EWEA 2009. Retrieved 13 March 2011. ^ "WINData LLC - Wind energy engineering since 1991". WINData LLC. Retrieved 28 May 2015. ^ "Introduction". 7 August 2011. Archived from the original on 19 July 2011. Retrieved 15 September 2017. ^ "Historic Wind Development in New England: The Age of PURPA Spawns the "Wind Farm"". U.S. Department of Energy. 9 October 2008. Archived from the original on 27 May 2010. Retrieved 24 April 2010. ^ "Wind Energy Center Alumni and the Early Wind Industry". University of Massachusetts Amherst. 2010. Retrieved 24 April 2010. ^ a b c d e f g h "2014 China Wind Power Review and Outlook" (PDF). GWEC. Retrieved 12 November 2015. ^ United Nations Framework Convention on Climate Change. "CDM: Gansu Guazhou 300 MW Wind Power Project". Retrieved 28 May 2015. ^ "Jiuquan wind power base completes first stage". China Daily. Retrieved 2 March 2014. ^ "Winds of change blow through China as spending on renewable energy soars". The Guardian. Retrieved 2 March 2014. ^ BS Reporter (11 May 2012). "Suzlon creates country's largest wind park". Retrieved 28 May 2015. ^ a b c d "Drilling Down: What Projects Made 2008 Such a Banner Year for Wind Power?". Retrieved 28 May 2015. ^ "The Largest Wind Farm in Europe Goes Into Trial Operation" (Press release). CEZ Group. Retrieved 28 May 2015. ^ Ahmed, Mohamed. "Modeling and Simulation of ICT Network Architecture for Cyber-Physical Wind Energy System". Retrieved 16 December 2018. ^ "China – Dabancheng Wind Farm now has a combined generating capacity of 500 MW". Retrieved 28 May 2015. ^ a b Environmental and Energy Study Institute (October 2010). "Offshore Wind Energy" (PDF). ^ "Walney". 4COffshore. 9 February 2012. Retrieved 6 September 2018. ^ "London Array comes online". Archived from the original on 17 December 2013. Retrieved 9 April 2013. ^ Zaken, Ministerie van Economische. "Aansluiting Windpark op zee - Gemini". www.rijksoverheid.nl (in Dutch). Retrieved 8 May 2017. ^ "Greater Gabbard Offshore Wind Project, United Kingdom". ^ "VIPs cut ribbon at 400MW Anholt" Recharge News, 4 September 2013. Accessed: 4 September 2013. ^ Jan Bjerre Lauridsen & Søren Andersen. "Queen says Good Wind to giant turbines" Berlingske, 4 September 2013. Accessed: 4 September 2013. ^ "All turbines at Anholt Offshore wind farm now operational" (Press release). DONG Energy. 20 June 2013. Archived from the original on 6 October 2013. Retrieved 27 August 2013. ^ "BARD 1 (4c)". Retrieved 28 May 2015. ^ "Rösler eröffnet Offshore-Windpark Bard 1". Archived from the original on 28 August 2013. Retrieved 26 August 2013. ^ "Offshore Layout". E.ON. Archived from the original on 3 September 2016. ^ "Rampion Offshore Wind Farm". 4C Offshore. ^ "C-Power". C-power. 9 July 2013. Archived from the original on 21 September 2013. Retrieved 9 July 2013. ^ "Last turbine in at Thornton Bank". Rechargenews. 4 July 2013. Retrieved 9 July 2013. ^ "SWT-3.6-107 Wind Turbine". Siemens. Archived from the original on 25 July 2008. Retrieved 19 July 2009. ^ "Sheringham Shoal Operated by Statkraft". Sheringham Shoal. Archived from the original on 25 April 2015. Retrieved 28 May 2015. ^ "Norway's Crown Prince Opens Sheringham Shoal Offshore Wind Farm (UK)". Offshore Wind. Retrieved 28 May 2015. ^ "Thanet". The Engineer Online. 25 July 2008. Archived from the original on 27 May 2012. Retrieved 26 November 2008. ^ "Thanet offshore wind farm starts electricity production". BBC News. 23 September 2010. Retrieved 23 September 2010. ^ Garvine, Richard; Kempton, Willett (2008). "Assessing the wind field over the continental shelf as a resource for electric power" (PDF). Journal of Marine Research. 66 (6): 751–773. doi:10.1357/002224008788064540. ISSN 0022-2402. Archived from the original (PDF) on 20 July 2011. Retrieved 30 November 2009. ^ Offshore wind development hits a snag in Ontario Archived 9 January 2012 at the Wayback Machine Alberta Oil Magazine, April 2011. Retrieved 29 September 2011. ^ Hamilton, Tyler (15 January 2008). "Ontario to approve Great Lakes wind power". The Star. Toronto. Retrieved 2 May 2008. ^ "Naikun Wind Development, Inc". Archived from the original on 16 May 2008. Retrieved 21 May 2008. ^ Jannicke Nilsen. "Slik utstyres de norske skipene for å takle nye gigant-vindmøller". Tu.no. ^ AWES Farm Density Airborne Wind Energy Labs, March 2014. Retrieved 20 March 2014. ^ Romanuke, Vadim (2018). "Wind Farm Energy and Costs Optimization Algorithm under Uncertain Parameters of Wind Speed Distribution" (PDF). Studies in Informatics and Control. 27 (2): 155–164. doi:10.24846/v27i2y201803. Retrieved 21 February 2019. ^ "Collgar Wind Farm". Collgar Wind Farm. Retrieved 28 May 2015. ^ Australian Energy Market Operator Limited (2010). South Australian Supply Demand Outlook Archived 11 March 2011 at the Wayback Machine p. 35. ^ Parliament of Australia (19 February 2010). Operating wind farms by Commonwealth Electoral Division Archived 16 January 2011 at the Wayback Machine Background note. ^ New, Robert (November 2010). Electricity generation Major development projects – October 2010 listing Archived 16 March 2011 at the Wayback Machine Australian Bureau of Agricultural and Resource Economics, p. 8. ^ Canadian Wind Energy Association (2010). "Map of Installations". Retrieved 17 September 2010. ^ "China's Revolution In Wind Energy". GWEC. 12 May 2015. Archived from the original on 18 May 2015. Retrieved 28 May 2015. ^ "Release of global wind statistics: Wind Energy Powers Ahead Despite Economic Turmoil". Global Wind Energy Council. ^ "Global Wind Statistics 2011" (PDF). 7 February 2012. Archived from the original (PDF) on 11 June 2012. ^ Liu Yiyu (5 April 2012). "Turbine makers take a breather". China Daily USA. ^ Lars Kroldrup (15 February 2010). "Gains in Global Wind Capacity Reported". The New York Times. ^ Gow, David (3 February 2009). "Wind power becomes Europe's fastest growing energy source". The Guardian. London. Retrieved 31 January 2010. ^ "Oceans of Opportunity: Harnessing Europe's largest domestic energy resource" (PDF). EWEA. September 2009. pp. 18–19. ^ Megan Treacy (16 September 2009). "China Could Replace Coal with Wind". Ecogeek.org. Archived from the original on 15 October 2009. Retrieved 31 January 2010. ^ Caprotti Federico (Spring 2009). "China's Cleantech Landscape: The Renewable Energy Technology Paradox" (PDF). Sustainable Development Law & Policy: 6–10. Archived from the original (PDF) on 9 June 2011. Retrieved 31 January 2010. ^ a b "Renewables Global Status Report: 2009 Update" (PDF). REN21. 2009. p. 16. Archived from the original (PDF) on 12 June 2009. ^ Adrian Lema & K. Ruby. "Towards a policy model for climate change mitigation: China's experience with wind power development and lessons for developing countries". Energy for Sustainable Development. 10 (4). ^ "CN : China ranks third in worldwide wind energy – Alternative energy news". Instalbiz.com. 4 January 2010. Retrieved 31 January 2010. ^ "Wind in power 2011 European statistics" (PDF). European Wind Energy Association. February 2012. p. 4. Retrieved 17 June 2012. ^ "GLOBAL WIND 2009 REPORT" (PDF). Global Wind energy council. March 2010. Archived from the original (PDF) on 5 July 2010. Retrieved 9 January 2011. ^ "UK Wind Energy Database (UKWED)". RenewableUK. Archived from the original on 26 November 2015. Retrieved 28 May 2015. ^ "Fantanele-Cogealac Wind Park". Cez Group. Retrieved 14 October 2011. ^ "ČEZ says its wind farm in Romania is the biggest in Europe". Prague Daily Monitor. 12 October 2012. Archived from the original on 22 May 2013. Retrieved 12 October 2012. ^ "A Supergrid for Europe". MIT Technology Review. Retrieved 28 May 2015. ^ David Cifuentes & Víctor M. Rodríguez. "Renewable energy" (PDF). p. 11. Archived from the original (PDF) on 3 December 2007. ^ "Wind atlas of India". Retrieved 28 August 2014. ^ "Indian Wind Energy and Economy". Indianwindpower.com. Archived from the original on 17 August 2013. Retrieved 6 August 2013. ^ "Ministry of New and Renewable Energy - Achievements". Mnre.gov.in. 31 October 2013. Archived from the original on 1 March 2012. Retrieved 6 December 2013. ^ "Invest in Morocco - Wind Energy". www.invest.gov.ma. Retrieved 19 June 2016. ^ "Energie Eolienne". www.mem.gov.ma. Retrieved 19 June 2016. ^ "ADB grants $ 300 m to boost renewable energy". Archived from the original on 18 May 2015. Retrieved 28 May 2015. ^ "Electrawinds". Coega Development Corporation. Retrieved 6 January 2010. ^ Swanepoel, Esmarie (11 September 2009). "Belgium company plans R1,2bn Eastern Cape wind farm". engineeringnews.co.za. Retrieved 6 January 2010. ^ "15-megawatt wind farm planned for Kouga". Cacadu District Municipality. Archived from the original on 23 July 2011. Retrieved 6 January 2010. ^ "Electrawinds launches 1st wind turbine at Coega". MSN. Archived from the original on 8 July 2011. Retrieved 13 May 2010. ^ "Development of a 57.5MW Wind Energy Project". Public Process Consultants. Retrieved 9 October 2010. ^ a b "Wind energy". dme.gov.za. Archived from the original on 7 January 2010. Retrieved 11 January 2010. ^ "Minister switches on the Darling Wind Farm". CEF. 23 May 2008. Retrieved 21 April 2010. ^ "KLIPHEUWEL WINDFARM". Eskom. Archived from the original on 10 June 2011. Retrieved 11 January 2010. ^ "Klipheuwel shows the way in renewable energy". engineeringnews.co.za. 23 April 2004. Retrieved 11 January 2010. ^ "SA to get third wind farm". South Africa: The Good News. 29 March 2009. Archived from the original on 9 May 2015. Retrieved 21 April 2010. ^ Gosling, Melanie (9 September 2015). "Another wind farm joins the grid". Cape Times. Retrieved 12 September 2015. ^ "Q3 Report: American Wind Energy Third Quarter Market Report" (PDF). AWEA. 17 October 2012. Archived from the original (PDF) on 12 January 2013. Retrieved 2 January 2013. ^ a b "2012 AWEA Third Quarter 2012 Market Report" (PDF). Archived from the original (PDF) on 12 January 2013. Retrieved 2 January 2013. ^ a b "U.S. Wind Energy Industry Installs over 1,600 MW in Third Quarter". Archived from the original on 19 September 2010. Retrieved 30 December 2010. 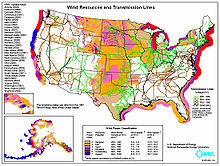 ^ American Wind Energy Association (2009). Annual Wind Industry Report, Year Ending 2008 Archived 20 April 2009 at the Wayback Machine p. 17. ^ a b American Wind Energy Association (2009). Annual Wind Industry Report, Year Ending 2008 Archived 20 April 2009 at the Wayback Machine pp. 9–10. ^ "Nine out of 10 people want more renewable energy". The Guardian. 23 April 2012. ^ "Renewables 2015 Global Status Report" (PDF). REN21. 2015. p. 27. Archived from the original (PDF) on 21 July 2015. Retrieved 28 August 2015. ^ Groth, Theresa M., and Christine A. Vogt. "Rural wind farm development: Social, environmental and economic features important to local residents." Renewable Energy 63.2014 (2013): 1-8. ScienceDirect. Web. 9 February 2014. ^ Sturge, D., A. While, and R. Howell. "Engineering and energy yield: The missing dimension of wind turbine assessment." Energy Policy 65.2014 (2013): 245-50. ScienceDirect. Web. 9 Feb. 2014. ^ a b Begoña Guezuraga; Rudolf Zauner; Werner Pölz (January 2012). "Life cycle assessment of two different 2 MW class wind turbines". Renewable Energy. 37 (1): 37. doi:10.1016/j.renene.2011.05.008. ^ Mark Diesendorf (Summer 2003). "Why Australia needs wind power" (PDF). Dissent (13): 43–48. Archived from the original (PDF) on 6 July 2011. ^ Eilperin, Juliet; Steven Mufson (16 April 2009). "Renewable Energy's Environmental Paradox". The Washington Post. Retrieved 17 April 2009. ^ a b c Novella, Steven (7 March 2016). "Wind Turbine Controversy". Neurologica Blog. Retrieved 25 July 2016. ^ Cappiello, Dina. "US wind farms get pass on eagle deaths". Associated Press, 14 May 2013. ^ 'Wind Energy - The Facts', p. 1. ^ Pagano, Margareta (2 August 2009). "Are wind farms a health risk? US scientist identifies 'wind turbine syndrome' - Noise and vibration coming from large turbines are behind an increase in heart disease, migraine, panic attacks and other health problems, according to research by an American doctor". The Independent. ^ Committee on Environmental Impacts of Wind Energy Projects, National Research Council (2007). Environmental Impacts of Wind-Energy Projects, p. 158-9. ^ General Purpose Standing Committee No. 5, Parliament of New South Wales (16 December 2009). "Final Report, Rural Wind Farms". ^ Rubin, GJ; Burns, M; Wessely, S (7 May 2014). "Possible psychological mechanisms for "wind turbine syndrome". On the windmills of your mind". Noise & Health. 16 (69): 116–122. doi:10.4103/1463-1741.132099. PMID 24804716. ^ Swan, Norman (6 July 2015). "Wind farm syndrome and other imaginary ailments - Science cannot explain how wind turbines cause the illness known as wind farm syndrome". Cosmos. ^ "BUFFALO GAP WIND FARM, L.L.C., BUFFALO GAP WIND FARM 2, L.L.C., AND BUFFALO GAP WIND FARM 3, L.L.C. 'S APPEAL AND COMPLAINT OF ERCOT'S DECISION AND ACTION REGARDING PRR 830 AND MOTION FOR SUSPENSION OF ACTION" (PDF). ERCOT.com. ERCOT. Retrieved 3 October 2015. ^ Wind farm interference showing up on Doppler radar National Weather Service. Retrieved 9 February 2011. ^ Brenner, Michael et al. Wind Farms and Radar Federation of American Scientists, January 2008. Retrieved 9 February 2011. ^ Greenemeier, Larry. Wind turbine or airplane? New radar could cut through the signal clutter Scientific American, 3 September 2010. Retrieved 9 February 2011. ^ About the R-2508 Airspace Archived 4 December 2008 at the Wayback Machine United States Air Force. Retrieved 9 February 2011. ^ Hayes, Keith. MCLB Barstow wind turbine a Marine Corps first United States Marine Corps, 27 March 2009. Retrieved 9 February 2011. ^ Goodwin, Jacob (3 January 2011). "DHS asks Raytheon to study impact of wind turbines on radar systems". gsnmagazine.com. Retrieved 9 February 2011. ^ Radars and radio signals Archived 7 April 2011 at the Wayback Machine Wind Energy Facts. Retrieved 9 February 2011. ^ Levitan, David. Wind turbines cause radar cone of silence IEEE, 9 February 2010. Retrieved 9 February 2011. ^ "Air Force: Cape Wind farm would have no impact on radar station". capecodtoday.com. 17 November 2007. Archived from the original on 8 July 2011. Retrieved 9 February 2011. ^ P Jago, N Taylor. Wind turbines and aviation interests – European experience and practice Archived 11 December 2010 at the Wayback Machine pages 10–13, Stasys, 2002. Retrieved 9 February 2011. ^ Learmount, David. Newcastle airport radar develops fix for wind turbine interference Flight Global, 17 November 2010. Retrieved 9 February 2011. ^ QinetiQ and Vestas test 'stealth technology' for wind turbines Renewable Energy Focus, 26 October 2009. Retrieved 22 September 2010. ^ 'Stealth' wind turbine blade may end radar problem Reuters via Cnet, 27 January 2010. Retrieved 22 September 2010. ^ Fairly, Peter. Stealth-Mode Wind Turbines Technology Review, 2 November 2009. Retrieved 22 September 2010. ^ Appleton, Steve. Stealth blades – a progress report Archived 8 June 2011 at the Wayback Machine QinetiQ. Retrieved 22 September 2010. ^ Glenn Cramer (30 October 2009). "Town Councilor regrets High Sheldon Wind Farm (Sheldon, NY)". River City Malone.com. Retrieved 4 September 2015. ^ "Technology". Broadcast Wind, LLC. Retrieved 4 September 2015. ^ "IMPACT OF WIND FARMS ON RADIOCOMMUNICATION SERVICES". TSR (grupo Tratamiento de Señal y Radiocomunicaciones de la UPV/EHU). Archived from the original on 23 September 2015. Retrieved 4 September 2015. ^ Roy, Somnath Baidya. Impacts of wind farms on surface air temperatures Proceedings of the National Academy of Sciences, 4 October 2010. Retrieved 10 March 2011. ^ Takle, Gene and Lundquist, Julie. Wind turbines on farmland may benefit crops Ames Laboratory, 16 December 2010. Retrieved 10 March 2011. Righter, Robert W. Windfall: Wind Energy in America Today (University of Oklahoma Press; 2011) 219 pages; looks at the land-use decisions involved in setting up a wind farm. Wikimedia Commons has media related to Wind farm.